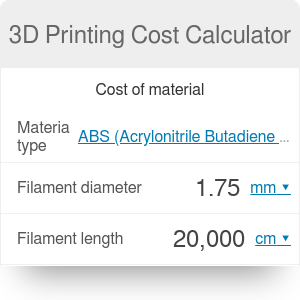 Whether you're just starting out or running a professional 3D printing business, this 3D printing cost calculator will surely come in handy. After inputting a few basic parameters, you will be able to accurately determine what you should charge for any job. Naturally, if you don't own a 3D printer and are trying to figure out how much does it cost to 3D print, this calculator is also a tool for you! Make sure to keep reading to understand the fundamental principle behind it or to find out which filament type is the best for your project. Our 3D printer calculator splits the total cost of a 3D printing job into two parts: the material cost, corresponding directly to the material that will be used, and labor cost, associated with the time of printing. Additionally, you can add a markup to ensure you're getting at least some profit on each item you print. price is the cost of material per unit weight (per kilogram or pound). hourly rate is the cost per one hour of 3D printing. Voilà - you just found the total price of a 3D printing job! Make sure to experiment with the result, for example by changing your hourly rate or by adding half an hour to printing time to simulate a jammed extruder that you need to fix. You probably noticed that the material cost depends on three main factors: the volume of the material, its density, and its price. While the volume depends solely on the project you're about to print, the other two are associated with the type of filament. In our 3D printing cost calculator, you can choose between six most common filament types. If you're using a different one, open the advanced mode to manually input its density. 3D Printing Cost Calculator can be embedded on your website to enrich the content you wrote and make it easier for your visitors to understand your message.